Marble Falls, Texas is a community beautifully situated along the Colorado River in the Hill Country of Texas. It is a city of about 6,000 residents located 45-miles northwest of the capital of Austin. Lake Marble Falls is the smallest of the Highland lakes, and was created as a reservoir in 1951 when the Max Starcke Dam was completed. Texas "pink" granite quarried at Granite Mountain, just west of the community, was used in the construction of the state capitol building. The still-operating quarry also supplied granite for the Galveston seawall. Creative items sculpted from granite are available at the gift shop. The Marble Falls buyer will find many homes for sale that benefit from majestic views of the Texas hill country. Many Marble Falls properties also offer views of Lake Marble Falls. The real estate in Marble Falls runs the gamut from modest ranches to multi-million dollar luxury estates. Lots and acreage are available on which one can build their own custom home. Former Confederate General Adam Rankin Johnson founded the town in 1887. He became known as "Stovepipe" Johnson after using stovepipes and wagon wheels in duping the Union Army into believing his forces were in possession of far more cannons than they actually had. His vision of building a modern industrial community along the shores of the Colorado River was realized, and by the 1890s there were 1,800 citizens living in Marble Falls. Marble Falls has a unique distinction in the annals of women's rights in the U.S. In 1917, Ophelia Crosby "Birdie" Harwood became the nation's very first woman mayor, several years before women were allowed to vote. Owners of Marble Falls real estate enjoy a variety of lakes in the area. Lake Buchanan is the second largest of the Highland Lakes. It is an uncrowded destination for both fishermen and campers. Lake LBJ is popular because the water remains at a constant level. As a result, of water recreation is very popular here. Inks Lake, in Inks Lake State Park, is a great place to go fishing, camping, and swimming. They also hold different events ranging from kayaking to star seeing to cliff jumping at Devils Waterhole. Because Lake Travis is one of the clearest lakes in all of Texas, it is also popular among scuba divers. Lake Travis, the largest of the Highland Lakes, hosts avid anglers, boaters, scuba divers, and swimmers. Nearby Canyonlands National Wildlife Refuge is also a popular destination. The diverse ecology, protected habits for endangered species, and extensive trails attract many nature aficionados. The historic Main Street District in Marble Falls is related with eclectic shops, fine boutiques, restaurants, a theater, and a farmer's market. The Falls on the Colorado Museum honors the heritage of Marble Falls. Artifacts and exhibits allow for an immersive experience in Texas history. In nearby Burnet, there's the Fort Croghan Museum and an Air Force Museum. Visit the authentic blacksmith's shop, one-room schoolhouse, and the stage coach shop. Over a thousand artifacts are on display. The train depot in Marble Falls is another historic site that dates back to over a century ago. Slice through the canopies of hundred-foot tall cypress trees just fifteen minutes away at the Cypress Valley Canopy Tours. The area's geology and climate have been conducive to the development of some fine wineries in the area. In fact, the "Heart of Texas" Wine Tours operates out of Marble Falls. Every August, Lake Marble Falls is the host of the annual "Lakefest" boat races. This event is notable for the largest field of drag racing boats in the U.S. The action in Austin is worth a 49 mile road trip, and many residents get the multi-day pass each year in order to attend the Austin City Lights Festival, one of the largest music festivals in the Southwest. Scott & White Hospital is now open in Marble Falls, only ten miles from Horseshoe Bay. This modern medical facility offers a variety of services and 24-hour emergency care, bringing the highest level of healthcare to Horseshoe Bay real estate owners. The lakeside community of Marble Falls offers fun recreational and social action, a vibrant Texas lifestyle, and lovely homes. When you fall for Marble Falls, make the call to Josette Newberry at 512-632-2477. 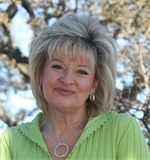 She is an experienced professional who knows the Marble Falls and the Lake LBJ market. She can guide you in finding the elegant home of your dreams in Marble Falls, Texas!